Situated in Piazza del Popolo, the fine Palazzo del Capitano del Popolo is a simple construction of a severe grandeur, typical of the style of the first stage of the city’s free Comune status. 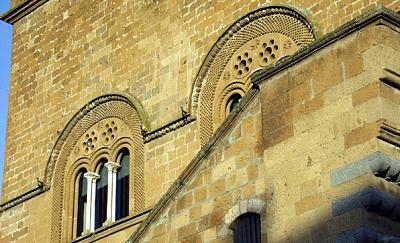 A number of important buildings in Orvieto mirror certain architectural elements of this palazzo, from the bishop’s palace to the Palazzo dei Papi, as well as a number of family houses. Details such as the grandiose arches that support the ground floor of the building, or the chequered cornices of the windows, appear recurrently throughout the city. Work on the construction of the palazzo began in the 13th century, possibly by order of Neri della Greca, on an area that had been occupied since 1157 by the Papal Palace built under the reign of Pope Hadrian IV. Following a long period of civil unrest in Orvieto, this building had fallen into a poor state of repair, and some records indicate that it had also been damaged by fire. Originally the Palazzo del Capitano was composed of a single ground floor loggia, used as a market place or for meetings, from which the magistrate would harangue the people. The stairs that led up to the loggia had originally flanked one of the perimeter walls of the previous building. This was the spot where the surrounding lords and other vanquished cities came to pay their allegiance to Orvieto. In 1375 the city of Orvieto submitted to the Church here. The structure was enlarged within ten years of it having been completed and in 1315 the bell tower was added. In 1316 Poncello Orsini, then Capitano del Popolo, gave orders for a great bell, emblazoned with the symbols of the arts, to be hung in the tower. The upper part of the structure was covered in 1472 and the large hall divided into two rooms, one large and the other small. The larger of the two occupied an area that corresponds roughly to the room we know today as the Sala dei Quattrocento. After having functioned as a residence for the Capitano del Popolo, the Podestà and the Signori Sette, from1463 the palazzo housed the lower part of the Monte di Pietà, and from 1651 the Monte Frumentario. From 1596 one of the lower section rooms housed the Studium, which had been re-instituted a few years earlier by Lorenzo Magalotti Students of law, theology and logic came here to study twice a day, each time the bell of Palazzo del Popolo rung, until1651. No more records of this ancient university, which some sources indicate as dating back to 1013 and which had connections with illustrious names such as the Benedictine monks Graziano and Gozio of Orvieto, appear after this date. In 1578 the upper floors of the palazzo were used as a theatre, with the Comune financing those citizens who staged public performances. Already in the first half of the 16th century the Accademia dei Giovani staged its productions here. Following the most recent restoration works carried out between 1987 and 1989, the Palazzo del Popolo is used as a conference centre. The recent works have also opened access to interesting archaeological remains beneath the building, including the foundations of a 5th century BC Etruscan temple and part of a Medieval aqueduct and cistern.